Hey, is it rosé season already? Maybe it creeps up on me because it's always rosé season at my place. We are taking a couple of weeks to spotlight some worthy pink wines which will help get us in the swing for spring. Founded in 1970 by Enrique Forner, Marqués de Cáceres is now run by his daughter, Cristina Forner, the fourth generation of the wine family. The bodega is located in the community of Cenicero in La Rioja Alta region of Spain. 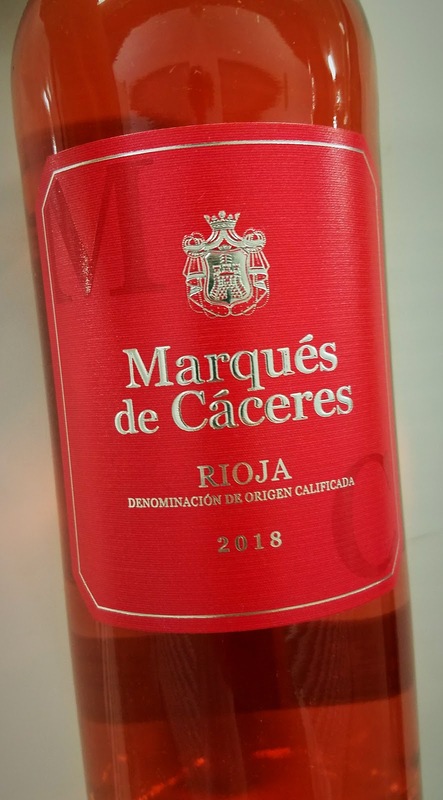 The 2018 Marqués de Cáceres Rioja Rosado is made from 96% Tempranillo grapes with a 4% splash of Garnacha Tinta. Alcohol clocks in at 13.5% abv and it sells for less than ten bucks. It isn't a terribly complex rosé, but it is quite tasty and ready to be chilled for picnics and barbecues. This dependable rosé is a rich, pink salmon color, with a mineral-laden nose featuring strawberry and cherry aromas. The palate is dry, fruity and laced with minerals. A good acidity provides for excellent food pairing and a refreshing demeanor on its own. There's a touch of orange peel on the finish.